Ah! We've been waiting a long time to present this particular piece of box art! Behold, Sharkos, "Il silenzioso predatore del mondo sottomarino di ISAURUS!" 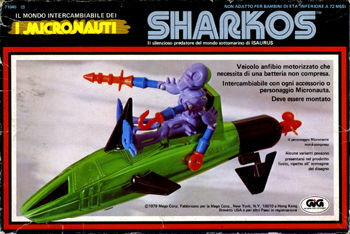 Sharkos looks like a big cucumber with fins and a propellor. He is obviously meant to be Antron's vehicle of choice. The best part about Sharkos is the box back, shown at bottom. The back of the box has a complete pictorial rundown on all the various aliens and alien vehicles! Everything from Hornetroid to Lobstros is shown, with a nice picture of the second series aliens in a Dario Argentoesque landscape as well! Kind of an alien checklist. Even better is the fact that most (if not all) of the pictures seem to be of the prototypes of the toys, instead of the finished pieces. 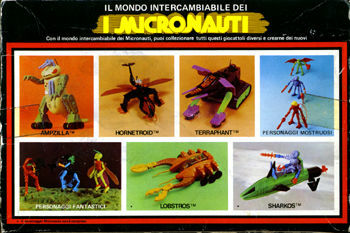 Among other anomalies, Membros' brain/hair is a bright yellow, instead of orange or green; Terraphant has a protective cover over the driver's seat and a cage-like cover over the back transport area as well as long, purple tusks instead of the rocket-type tusks; all the second series aliens have dark green brains.